This book defines how Bill Clinton would like to spend his post-presidency, and perhaps also defines what Bill Clinton would like to see as his legacy. It's about giving, as the title says. Clinton introduces the book with this: "When I left the White House, I knew I wanted to spend the rest of my life giving my time, money, and skills to worthwhile endeavors where I could make a difference." (p. ix). Cynics might note that Clinton's goal matches Jimmy Carter's post-presidential work, which earned Carter a Nobel Peace Prize in 2002 (as described on p. 6). The bulk of the book describes a litany of organizations to which the reader is encouraged to give their time, money, and skills. The litany of organizations really is overwhelming. It feels like do-gooder after do-gooder, without much sense of order to it. (Clinton's sense of order is in organizing the do-gooders by category: his chapters include "Giving Money", "Giving Time", "Giving Things", and "Giving Skills"). Of course, Bill Clinton is a famously persuasive guy, and despite my overwhelmed feeling, I'll admit that Bill Clinton did persuade me to give money to one do-gooder organization, Kiva, which makes microloans to entrepreneurs in the developing world (pp. 27-28). I suppose Clinton's goal with the overwhelming litany was to let the reader find the one organization that best fit their own sense of doing good (which he more or less says: "I hope this book has given you a better idea of the options available for effective giving", pp. 206-7). Critical readers might wonder why political giving is barely mentioned. The only vaguely political chapter, entitled "What About Government? ", describes government agencies as just another kind of organization dedicated to societal improvement. He cites Al Gore's environmental advocacy (pp. 163-164) without discussing Al Gore's presidential campaign. One is left to wonder if Clinton would count volunteering or donating to a political campaign as valid "giving" or not. That's especially pertinent because this book was published in 2007, immediately after which Bill Clinton spent the subsequent year giving lots of his own time and money and skills for a political campaign, Hillary Clinton's campaign for the presidency. We all know that Bill Clinton believes in politics -- so why doesn't he suggest giving time and money and skills to political campaigns? Evidently, he wants this book to appear more apolitical, perhaps because he knew it would be published on the eve of Hillary's campaign. 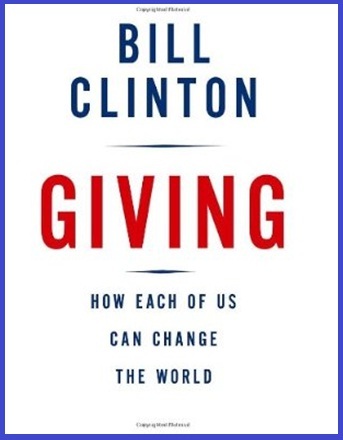 Clinton's closing chapter describes further the purpose of his writing this book: "I've done my best in this book to demonstrate that all kinds of giving can make a profoundly positive difference, that everyone has something valuable to give, and that countless individuals and organizations are asking for help" (p. 207). Yes, he demonstrated that, overwhelmingly, with lots of personal anecdotes and that litany of organizations. Clinton concludes with a "moral" of the story: "Will giving make you happier? You'll have to conclude that for yourself," he says on p. 210. He suggests the answer a few paragraphs later on p. 211, in his closing sentences: "Who's happier? The givers or the takers? I think you know the answer. There's a whole world out there that needs you, down the street or across the ocean. Give." Hillary Clinton: Founded Vital Voices Initiative with Madeleine Albright. Madeleine Albright: Founded Vital Voices Initiative with Hillary Clinton. Bill Clinton: Since 2001, 40-year high in corporate profit, but flat wages. Bill Clinton: 1980s: microcredit in rural Arkansas; 1990s: same across US. Bill Clinton: Post-prison work training reduces recidivism. Bill Clinton: Donated his saxophone to Save the Music school program. Hillary Clinton: 1986: HIPPY program empowers parents as kids' first teach. Al Gore: Virgin Earth Challenge: $25M to remove 1B tons of CO2. Al Gore: We need BOTH citizen action and better climate policy. Bill Clinton: Climate change is existential threat to civilization. Bill Clinton: 1977: Opposed AR nuclear power plant construction. Eliot Spitzer: Reduce state energy consumption levels by 2015. Hillary Clinton: Led delegation, with McCain, to see effects of polar warming. John McCain: Led delegation with Hillary, to see effects of polar warming. Mike Bloomberg: Make NYC first environmentally-sustainable city. Al Gore: "Earth in the Balance" one reason Clinton asked him to be VP. Bill Clinton: Worked with Bush Sr on Katrina relief in New Orleans. Bill Clinton: With Bush Sr, raised $14M for Asian tsunami reconstruction. George Bush Sr.: Bush-Clinton Katrina Fund for New Orleans relief. George Bush Sr.: With Clinton, raised $14M for Asian tsunami reconstruction. Hillary Clinton: Grew AR Children's Hospital to one of nation's 10 largest. Bill Clinton: Greatest regret: not sending troops against Rwanda genocide. Bill Clinton: 1999 Millennium Development Goals: forgive 3rd world debt. George W. Bush: Change food aid rules to allow more non-US materials. Bill Clinton: 1999: Agreed on fair-trade clothing purchases from Cambodia. Bill Clinton: Government matters, especially for big challenges. Arnold Schwarzenegger: Co-led effort against child obesity with Bill Clinton. Bill Clinton: Helped provide antiretrovirals to developing nations. Bill Clinton: Co-led bipartisan effort against child obesity. Bill Clinton: 2002: Signed on 69 nations to buy generic HIV/AIDS medicine. Mike Huckabee: Co-led effort against child obesity with Bill Clinton. Bill Clinton: 1990s: Bottom 20% of earners saw wage increase of 24%. Bill Clinton: Spend retirement giving; politics is a "getting" business. Jimmy Carter: 2002: won Nobel Peace Prize for post-presidential work. Bill Clinton: 1990s: Partner with automakers to develop high-mileage cars. Bill Clinton: Promote innovative ideas and "social entrepreneurs". Bill Clinton: Organize market to produce benefits from "public goods". Bill Clinton: Welfare reform succeeded because of focus on jobs. Bill Clinton: If wealthiest 1% gave away 5% of income, we'd meet all goals. Colin Powell: America's Promise helped 15M disadvantaged kids. Jesse Helms: U2's Bono convinced him to join millennium debt relief.